Paris : L. Martinet, 1862. Description : printed brochure ; frontis., -58 p. ; ill.: 1 phot. ; 23.5 cm. 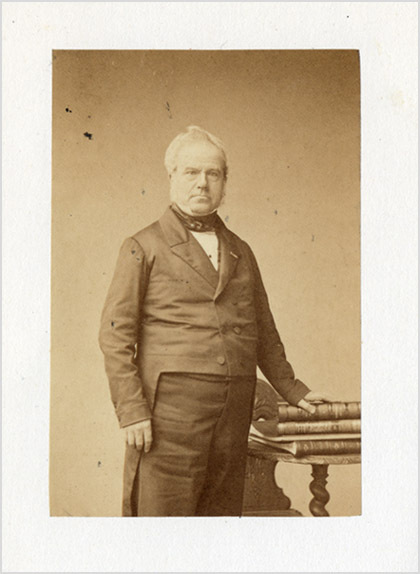 Photograph : mounted albumen, portrait of Jean-Baptiste-Marie Baillière. Subject : Medical biography — Jean-Baptiste-Marie Baillière. Official editor to the Académie de Médecine, 1827-1871. Inscribed: à Madame Germer Bailliere, souvenir l'affection et l'amitié, JBMB. Ephemera, one copy located in WorldCat. The publishing house of the dynastic Baillière family endures as one of the great monuments of the French Republic. It was founded on the consummate librarianship of Jean-Baptiste-Marie Baillière, who secured the imprimatur of the Académie de Médecine when he was appointed its official editor in 1827, a privileged position which he held for 34 years. His Paris firm and its branches in London, New York, Madrid, and Melbourne, published over 3000 medical titles during the nineteenth century and (apropos this collection) several of the very first medical publications that were generated by the invention of photography, notably the photographic atlases of Donné, Duchenne, and Luys. This pamphlet is a record of the toasts and bonhomies that were expressed during a 50th anniversary celebration of the firm, June 3, 1862. In 1877, Baillière compiled a genealogy titled, "Famille Baillière," that was probably distributed only to his immediate family. The year of his death it was reissued with four albumen portraits. Books and photographs embody the traces of living principles and so these pieces of ephemera from a great editor have a special place of honor in a bibliography of the first medical works published with photographs.